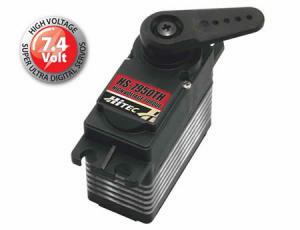 Introducing the next generation Ultra performance servos from Hitec. The "Ultra Torque" HS-7950TH features our second generation "G2" programmable digital circuit, Hitec's exclusive Titanium gear set, Heatsink case, and ultra power coreless motor making it arguably THE best R/C servo ever produced! This new circuit has twice the resolution of our original circuit while adding programmable overload protection. The HS-7950TH has been designed for the most demanding hobby applications including the largest aircraft and monster trucks. Featuring a titanic 486oz./in. of torque at 7.4 volts, all this power is harnessed by incorporating the industries first Titanium gears for incredible wear resistance and two strong hardened steel gear pins and axial brass bushing mounted in the servo case. 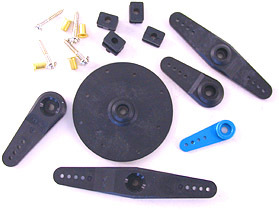 We offer the HS-7950TH servo in several configurations, 90° stock rotation, 180° modified rotation, continuous rotation (potentiometer is left outside the servo case) and reverse rotation. 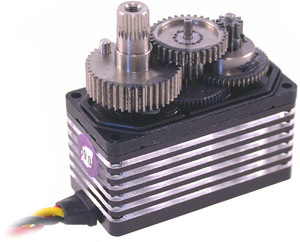 *Digital servos do not need to be programmed to operate. They work great right out of the box and purchasing a programmer is not neccessary. This servo can be configured to operate 180° two ways. Option 1, send a pulse signal ranging from 600usec to 2400usec. 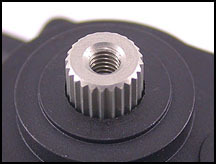 Option 2, use a Hitec HFP-21 programmer to modify the internal servo program.